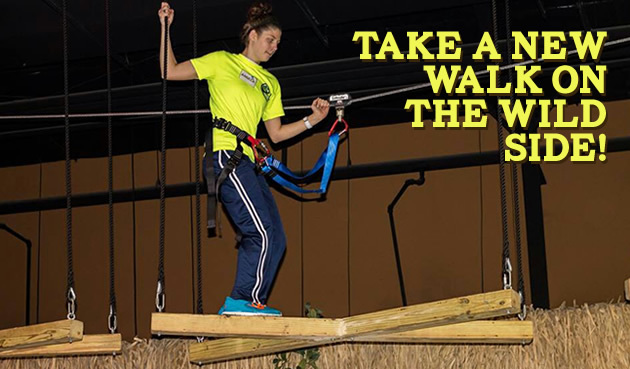 The Ropes Course Adventure is suspended 8 feet off the ground inside our facility. It is a high adventure course with a continuous tracking system that allows participants to go throughout the course without ever being totally disconnected at any time. Participants are outfitted in a locked, secure harness. Our course has eight elements that the participant challenges through including: barrels, a skateboard, netting and balancing beams. It is an exciting new addition to our center and we welcome the whole family to come take a new walk on the wide side! If you have a party, your birthday guests can complete the course after your party for a discounted rate of $7.